Hawaii Asks Federal Court For Clarification As Travel Ban Goes Into Effect : The Two-Way Critics of the new limits on entry into the U.S. from six mostly Muslim countries challenge the administration's definition of "close familial relationship." 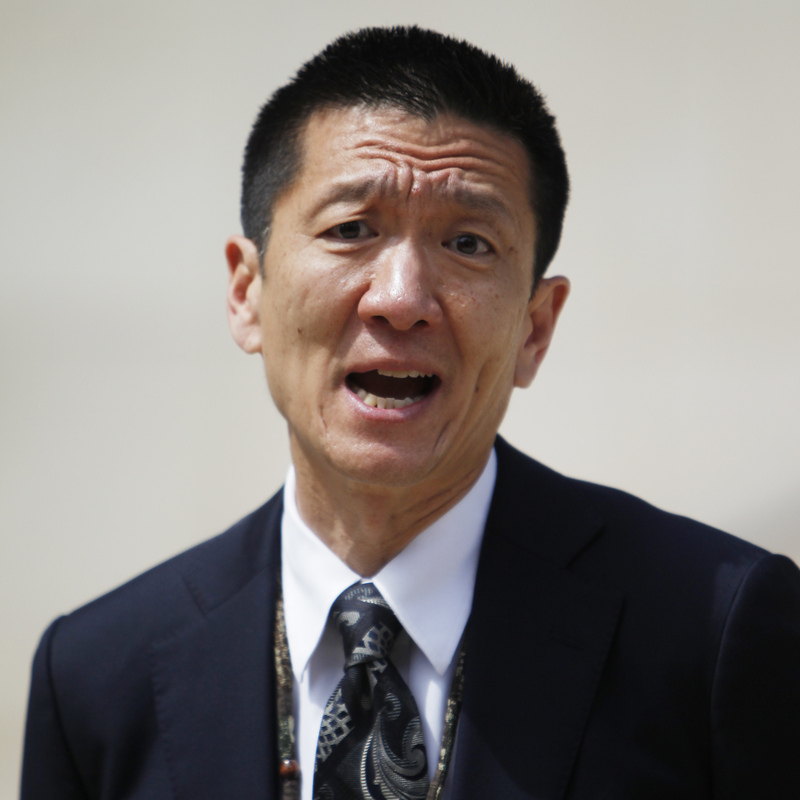 Hawaii Attorney General Douglas Chin speaks at a news conference in Honolulu in March. His office has asked a federal court to review the Trump administration's definition of close family, in the context of the travel ban. Shortly before President Trump's travel and refugee ban took partial effect Thursday evening, the state of Hawaii asked a federal court to clarify the scope of the U.S. Supreme Court's ruling on the president's executive order. The emergency motion filed in federal court in Honolulu is, in effect, a challenge to the Trump administration's definition of who can be excluded from the U.S.
On Monday, the U.S. Supreme Court let the Trump travel ban to go into effect for 90 days, but it allowed people with "close familial relationships" with someone in the United States to enter. That raised the question: what constitutes a close family relationship? In a statement, the attorney general of Hawaii, Douglas Chin, said his state asks for clarification "that the federal government may not enforce the controversial bans against fiances, grandparents, grandchildren, brothers-in-law, sisters-in-law, aunts, uncles, nieces, nephews and cousins of people currently living in the United States." The Trump administration earlier had told U.S. embassies and consulates around the globe that grandparents would not be considered "close family" eligible for entry. Nieces and nephews wouldn't make the cut either, but step-siblings and half-siblings would. In a teleconference briefing held in Washington D.C., a senior administration official said family relationships would be defined to include parents, spouses, children, adult sons or daughters, sons- and daughters-in-laws, and siblings. Another official said that definition of family is based on the Immigration and Nationality Act "and also what we saw in the Supreme Court decision." In an announcement late Thursday, the U.S. State Department included fiances among those who would be allowed entry. U.S. District Judge Derrick Watson is considering Hawaii's filing.